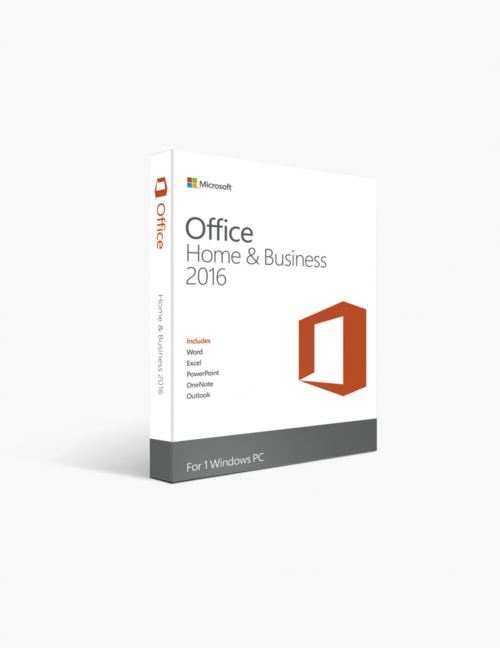 You're reviewing: Microsoft Office 2016 Home and Business - 1 Pc International License. Microsoft has been in the software making sector for a long time now. They have established a separate fan following for themselves with their products containing incredible features to back their present appeal in the market. Likewise, Microsoft Office 2016 was released to match the high expectations of users. One of its editions is named as Microsoft Office 2016 Home and Business. The package can be used anywhere in the world without any complications. Microsoft Office 2016 Home and Business inspires business people to create, edit, store and share well-polished files. As an individual who is in the business field, it is important to impress clients. With Microsoft Office 2016 Home and Business, you’ll be able to leave a solid mark on other individuals showcasing your real talent with ease. What Features Do You Receive With Microsoft Office 2016 Home and Business - 1 PC International License? Word 2016: Word 2016 is the best software available in the market for creating, editing and storing documents. It has a powerful feature like ‘Ink Editor’ which can be very useful while evaluating a specified document. The feature allows users to scribble over the document to make notes over required areas. Additionally, the software has included ‘Read Mode’ in its interface which clears all the disturbances on the window and lets the user peacefully read the document. Grammar and Spell Checking tools are enhanced too. With the addition of ‘Smart LookUp’ now users can browse information concerning each selected word in the document now. Excel 2016: Excel features a new interface which has been lacking in previous versions. Microsoft has given a much-needed upgrade for Excel in addition to new themes, new templates, and new charts. With these additions, now user can also group data between multiple tables and charts quickly. The existing data analysis tools are improved to make calculations in Excel 2016 easier. PowerPoint 2016: Microsoft has given extra attention towards providing more customization options to users. Some new transitions are added in this version of PowerPoint. Also, ‘Ink Replay’ and ‘Zoom’ features are added to allow users to review slides with ease. The interface has been enhanced to give it an alluring look. Like Word 2016, users can track changes of any change in the presentation. ‘Smart LookUp’ feature is also added in this edition of PowerPoint which helps users to have all the information they need at their corner. Outlook 2016: Business people love tools which can save their time. Microsoft has designed Outlook keeping what people in business love. When an individual clicks on the ‘Add Attachment’ option, the smart interface of Outlook display recent files which can eliminate the time-wasting action of searching for required files while attaching an attachment. ‘MyAnalytics’ is a unique feature added in the pack which gives users the knowledge concerning files which they have in common with other contacts. OneNote 2016: OneNote was released with a vision of giving users a digital notebook where they can keep notes and store audio files, video files, web pages, etc. The interface of OneNote has been enhanced by making space for more options in its notification tray. Whenever you open the application, ‘Quick Note’ appears by default. Thus, the user can keep the record of existing notes and create new notes with ease on the new smart interface of OneNote 2016. Why Microsoft Office 2016 Home and Business - 1 PC International License Is Best For Business? Many Well Pleased Users: Microsoft Office 2016 Home and Business has been awarded the tag of being the most powerful software which characterizes of principal features and tools. The software has developed a fan following among people in business all around the world. With positive reviews coming from all parts of the world, it certainly has many well-pleased users. Robust Business Tools: With the addition of ‘Smart Lookup,’ ‘Ink Editor,’ ‘Ink Reply,’ and other features, Microsoft Office 2016 Home and Business is a sturdy software which can curb all the requirements of business people. Best in The Business: The combination of robust business tools and a friendly user interface, Microsoft Office 2016 Home and Business is the leading software for giving business people everything that they want. Buy the product and take full advantage of the existing features of the package. These are minimum system requirements for installing Microsoft Office 2016 Home and Business - 1 Pc International License.